Exciting times at Bunker manor. Finally – after months of trials and tribulations – and patient strumming of fingers waiting for the pages to move closer to being finished – Dan’s words begin to appear on the pages of Moon 2. This means of course we are in the final stages of Moon 2 production. Not long to go now folks. 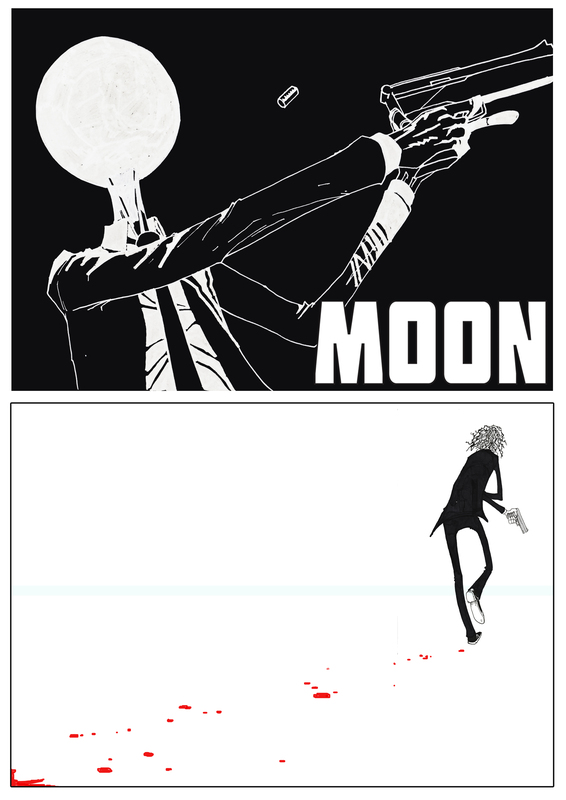 Moon 1 is still available digitally and in print. You can order each right here from Beyond the Bunker and Graphicly.com. Just click away below!! Moon has a great weekend at LSCC!! After a long weekend of meeting new fans and seeing old friends we can honestly say that the LSCC was a massive success for all involved. Hosted at Excel Centre it’s fair to say that everyone there will be leaving a space in their diary to see what’ll happen next year. Moon had a great weekend! The LSCC was incredibly successful. The idea of creating a comic book only event meant that everybody knew why they were there and had a great time. Harry Markos, one of the organisers and owner of Markosia Comics was very clear about the success of it. By the end of day 1 it had already proven itself more successful than any other con he’d been involved in. This was reflected in the weekend everyone had – including us. Sparse though it was, the simplicity of it’s message benefitted everybody and frankly pushed the British indy scene even further and faster ahead than it already had. Moon included which saw record sales over the weekend. Massive thanks to all the great people who stopped by, showed an interest and bought a copy. Nothing without you guys. We introduced some new things as well at this con. Alongside the book and the badges (free with every copy!) we are now supplying a set of prints featuring all the main characters from Issue 1. The most successful of the con turned out to be a simple image of Ray which surprised both me and Dan. Following the prints of Seven and Shades earlier this week I mentioned that I’d be posting up the other two planned prints that will be available at the Super Comic Con at the weekend. There will be 20 of each made (including a collection of all four). With so many spoilers in the pages of Moon 2 it’s impossible for me to show you more pages of Moon than we already have but never fear because it’s very, very close – and we think it’s looking very, very good… action, intrigue, high drama, moon heads!! It’s got it all!! Agent Seven is the first major threat that Moon deals with. He’s the single most destructive force in Moon’s life. He’s effectively a nasty b@stard. He’s lean, mean and not against the idea of dressing like a waitress to put bullets in his target. 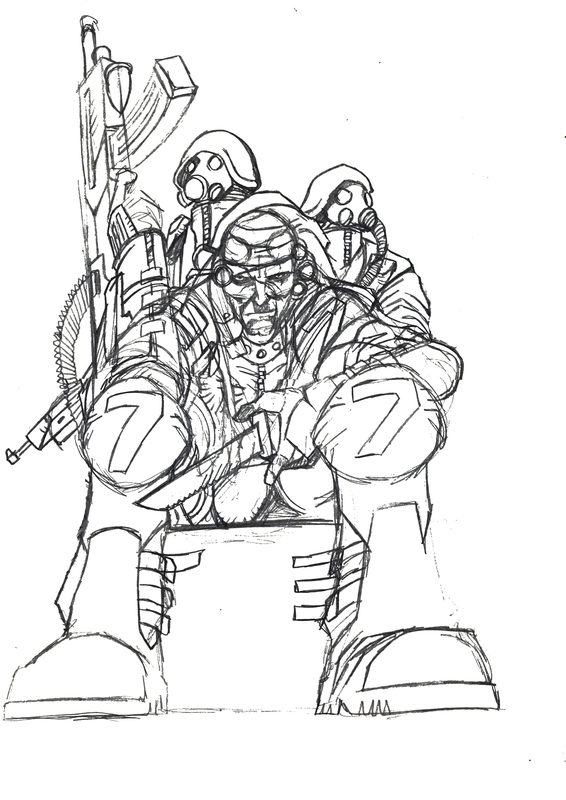 So finally, as Moon 2 nears completion, here’s the initial sketch work. 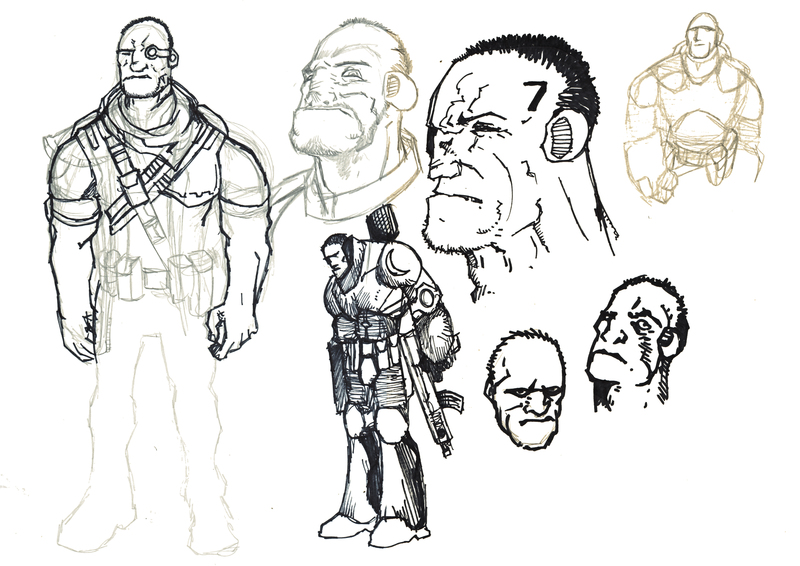 To set him apart from many of the other characters the initial design was much more thick set than in the final character. Dan had always envisaged Seven as a lean agent, toughened but not too lumbering. So I skinnied the dude up. Trust us, the future rogue’s gallery we have planned for Moon are a great many shapes and sizes. Seven, while a constant threat, is the most normal out of the batch – and arguably the most dangerous. This week a look at the background work going on on Moon 2. There is a considerable amount of back and forth between the art department (read: Myself and Ivanna Matilla) about how to approach each scene with possible outcomes having to be balanced between what the story asks for, what we’re trying to achieve and bottom line; what looks cool. Continuing the palette from Moon 1 of course but the situation has worsened considerably for our adventurers. How do you colour that. Iv is an incredibly reactive and quick colourist and rather than stooping to conquer, she stoops to colour and we’re eternally grateful for her input on this project. She certainly keeps me on my toes to the point where to question anything she does feels highly presumptive and frankly stepping above my station. Not because of her of course. She’s an upbeat delight. However, her sheer talent is enough to keep us on our toes. The marking hasn’t gone on this one though. Any doubt is swiftly queried with the sure hand of a teacher (as you’d expect from Iv as an English teacher just outside Buenos Aires). On my Iphone, I keep the digital clocks for Buenos Aires and Cape Town (to keep track of things when I’m working with Fallen Heroes / Tales of the Fallen colourist Gat Melvyn) and although Buenos Aires is two hours behind, Ivanna Matilla is years ahead of the rest of us. A genuine pleasure to work with. Moon 2 is on it’s way folks!! We will try to make sure that updates are here every Monday from now on – though this is difficult to maintain so there are no spoilers – and what spoilers there could be!! Remember of course that Moon is currently at the mercy of the mysterious Bingo Mole soldiers and the mercenary killer that has shot Ray. Electrocuted, weakened and surrounded Moon will of course try to make his escape. However, will it go to plan? For starters he needs his car and it looks like it’s being nicked by a certain Shades Rodriguez…. 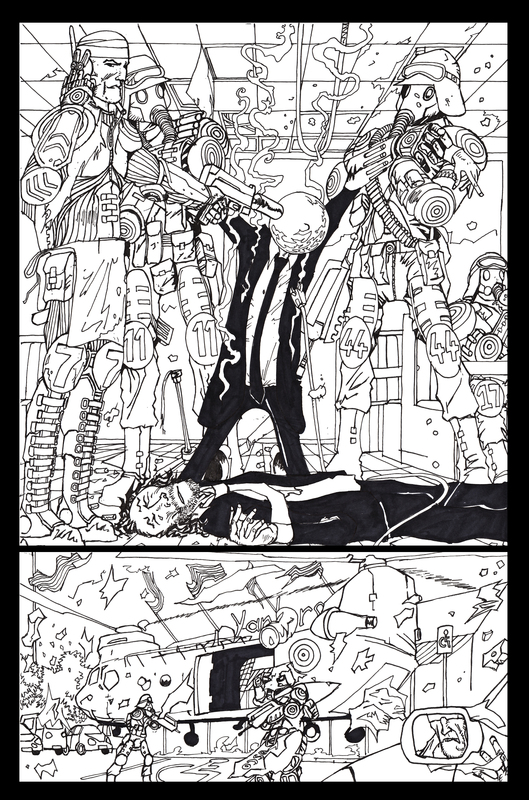 I remain excited at the prospect of being able to offer up the inks for Page 1, Issue 2 of Moon. This was a tester for me as we got back in the game to bring you the lunar shennanigans before. In my time off I was very clear in my mind as to what the drop points of the original were, not that anyone seemed to notice. The linework lacked the sharpness I was looking for and the clarity of composition I was hoping for. So I went in on 2 (and FH 2 – and even more so on Cy’s Reverend) with the intention to develop what had already been done without losing the tone of the original. 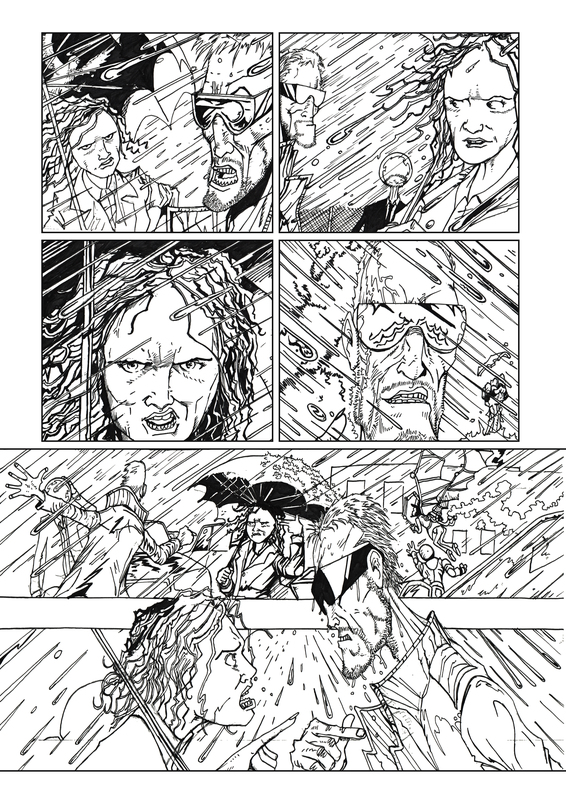 It can be difficult to develop within a series as the artwork shouldn’t change too dramatically from Page 1 to Page 150 frankly but when you’re in your early days – like I am – there’s a curve and it’d shortchange readers if you don’t follow that line. I’ve tried to hard to maintain the tone of Issue 1 but I hope Issue 2 proves sharper and cleaner, funnier and more engaging still than the original. 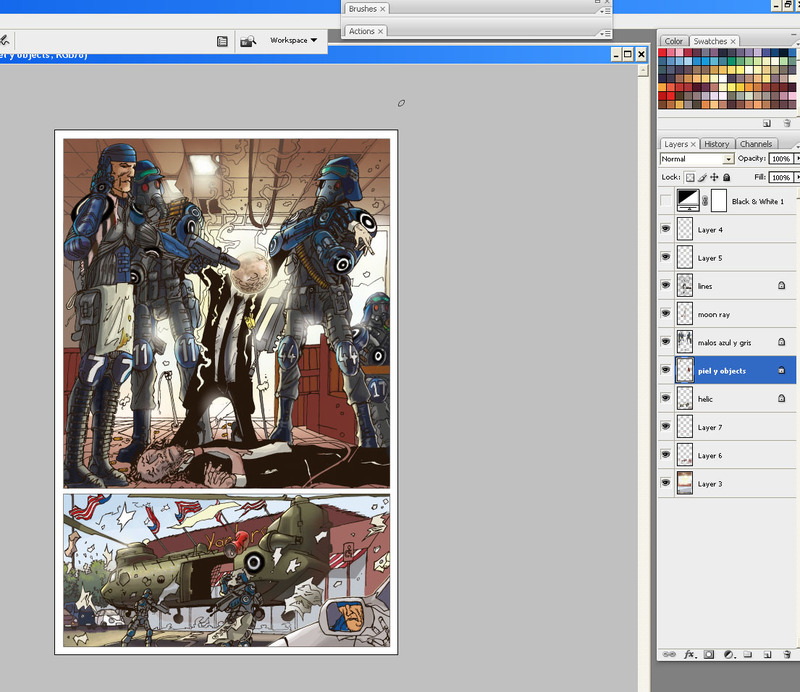 If Issue 1 was the intro, this is now the proving ground. Here’s hoping we’re up to it. All that’s left to do is send it over to Iv. 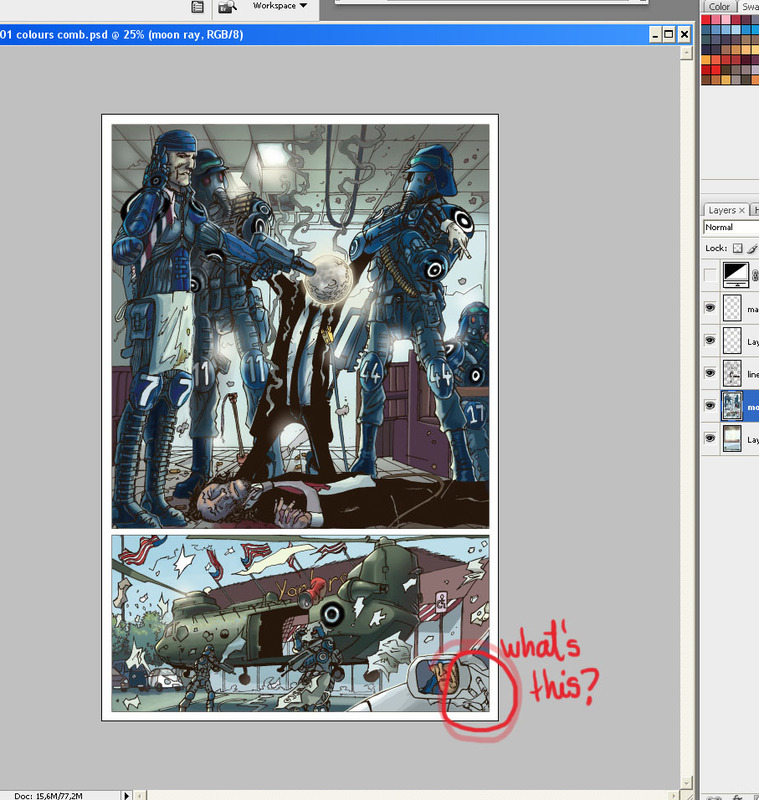 She’ll do what she always does and blow it clean out of the water with deft application of creation-like colour work. We love Iv and I personally have to thank her for being so patient while waiting for pages. She’s a colour obsessed angel. The end results of her efforts’ll be posted here as soon as they’re back. Moon’s back!! 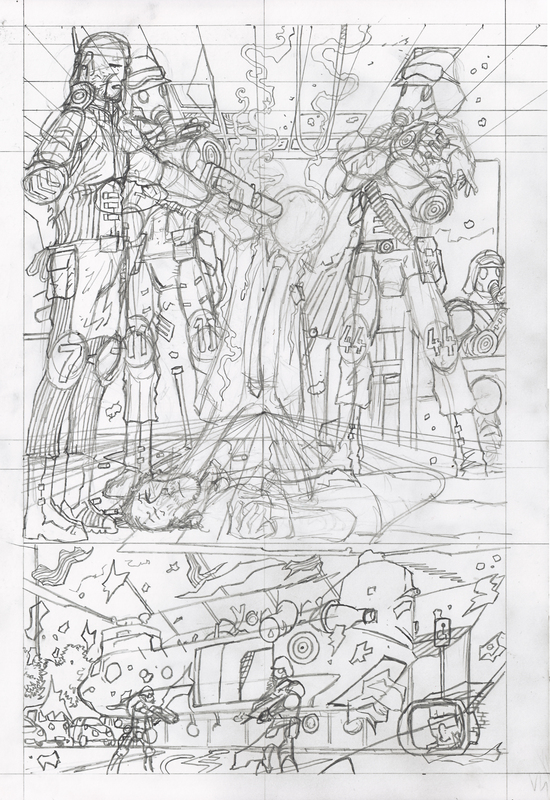 Page 1, Issue 2 Pencils!! All those looking bereft at your copy of Issue 1 and all those afraid for the future of our hero following the cliffhanger of Issue 1, fear not – for Issue 2 is on its way. 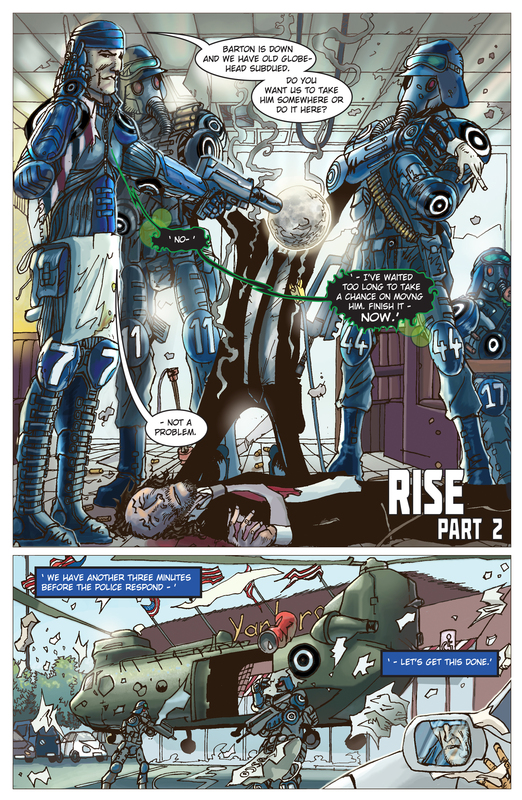 Page 1, Issue 2 is here to take a look at. As you can see – no much has changed in the life of Moon but it’s going to. Watch this space for more previews of Issue 2 (not too many though – as there’s some major spoilers on pretty much every page). It’s just so damn good to be drawing him again.